Recently AS changed his job. AS: I am worried now that I may not be able to give blood regularly like before. AS: Because the blood donation place is not nearby like before so I might forget when it’s time to donate blood. Isn’t he sweet that he is making blood donation a priority in his life I am so proud of him. As you can see me and AS are big on giving blood so please roll your sleeves and give blood. Please read these posts for more information. 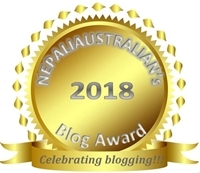 This entry was posted in He said, Health, Relationship and tagged health, M from nepaliaustralian, medicine, nepali australian, Nepaliaustralian. Bookmark the permalink. Donating blood is a great way to help others! I used to donate quite often, before discovery of my arrhythmia. Yay for him! I hope more people who could donate as they are always short of blood. He is indeed very thoughtful ! !